The Nintendo 3DS is a great portable gaming system with some really solid first and third party titles, but it seemed like Mario was just dominating the racing space on the handheld. While it may usually be a bad idea to go head-to-head against Nintendo’s first-party franchises, I think Sega may have created just enough variation to let Sonic & All-Stars Racing Transformed stand out from the competition and carve out its own personality. Once you start up the game you’ll be immediately greeted to the familiar if you’ve ever played an arcade-style racer before: career mode that has you unlocking new tracks by accumulating stars, unlockable characters, time trials, online multiplayer, etc. There isn’t really anything ground-breaking in this package, but that isn’t necessarily a bad thing. What actually is in this package is quite polished and fun to play – which is the most important thing, right? There are tons of classic (and current) characters to choose from. The roster dips as fast back as Alex Kidd and goes all the way up to the Crazy Taxi guy and Sonic. There are even some special guests like Wreck-it-Ralph from the hit Disney movie and real-life NASCAR driver Danica Patrick. 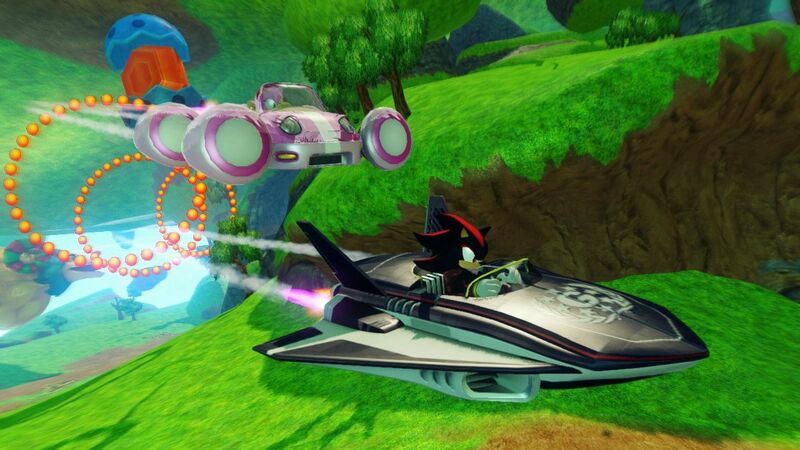 Each racer has a unique vehicle with unique stats that transforms for land, sea and air traversal – the fundamental hook to the gameplay. This lends an almost Diddy Kong Racing-esque vibe to the format, with the various different types of vehicles to race with. Throughout the course of a race, depending on the track, your vehicle could change from a car, to a boat, to a plane and back again. Each level is designed to compliment the various ways of racing in Transformed and they are easily the highlight of the entire experience. 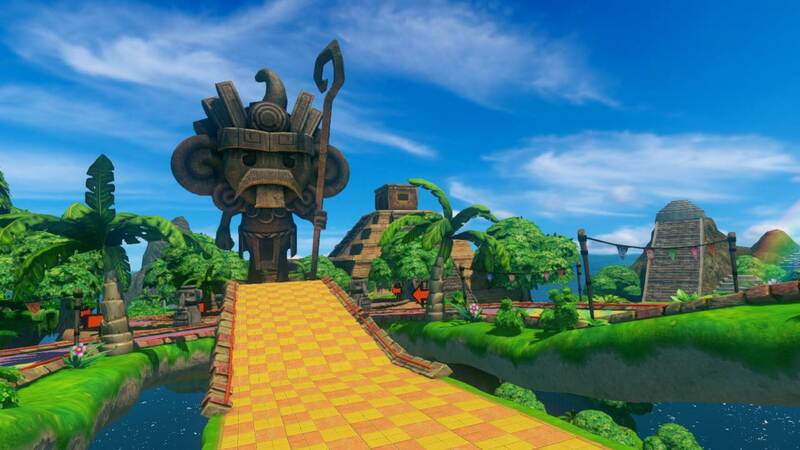 Each area is themed after a different franchise from Sonic, to Monkey Ball and even Panzer Dragoon. They all have a very distinct and unique personality, which is often complimented by the engaging 3D display (should you choose to enable it.) Racing games use the effect very well, as the field of vision is naturally created in a way that lends itself to 3D viewing. One of the major drawbacks for me personally was in the way of the powerups during races. You have all of the typical powers like homing missiles, boosts, regular rockets, mines and the like, but that is sort of the issue – nothing really felt uniquely Sega about the act of racing in this game. It would have been nice if the powers and abilities were more intimately tied to the long history of Sega franchises instead of easy substitutions for unoriginal items. This was even more evident due to the unique and incredibly inventive level designs that juxtaposed the poor item choices. Overall, I found myself playing Transformed in my down time. If I was waiting somewhere in public or just relaxing on the couch, I often reached for my 3DS to get a few races in for pure fun. The races are varied and balanced enough to keep the career mode fun for a while until you can unlock all of the goodies and the multiplayer is great fun to play with people you know. The track designs and character models are top-notch, even when surrounded by the less than imaginative items and powerups. If you’re a fan of arcade-style racers and have a sweet spot in your heart for Sonic and friends, you can find some fun with this game. However, it’s not quite as revolutionary or transformed as you might have hoped. This review was based on a retail review copy of the game for the Nintendo 3DS provided by Sega.